Charlie plays a newly adopted shelter dog who is about to get far more than he expected from his new family for Christmas. 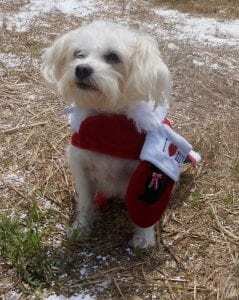 East Ellijay, Ga. – Meet Charlie, a little white dog with a big story to tell. His story is about a family with a Veteran suffering from PTSD and a wife and son trying to make sense of it. That story has brought filming to the North Georgia area, and specifically to East Ellijay at Highland Crossing. The lot of tiny homes next to Walmart was scouted and now used for an on-location shoot as the construction site for veteran John Frost, played by Aiden Turner. The film has actually moved across North Georgia with locations in Canton, Marietta, Ball Ground, and East Ellijay to just name a few. 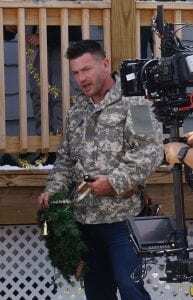 According to Producer Toni Hudson, the story follows the Frost family when Jill Frost, played by Hudson, takes on a large number of Christmas parties to make extra money at her store, “Jill’s Cakes and Bakes.” As she overworks herself waiting for her husband to return home from the war in Afghanistan after the new year. She is surprised when he arrives home five weeks early due to severe PTSD (Post-Traumatic Stress Disorder). Aiden Turner plays John Frost, a veteran with PTSD who faces a lot of issues coming home to his family from war. John comes home to his busy family and their newly adopted shelter dog, Charlie. However, John has never liked small dogs or seen them as “real dogs.” Coming home early throws a wrench into everyone’s plans and John and Charlie can’t seem to get along. As he tries to acclimate to civilian life, a particular night sees a bad episode of John’s PTSD in town and Charlie is severely injured from the event. As John copes with the disorder, Charlie is constantly trying to find his place in John’s life as this new person in the home. John gets a construction job while growing closer with Hank, a veteran friend and constant presence at the local Moose Lodge where his therapy group meets. One day, when Hank is nowhere to be found at the meeting, Charlie leads John out back of the lodge to find Hank face down in the snow with a heart attack. John also notices the homeless “tent village” where Hank lives. As John struggles with his own disorder, fitting into society, dealing with Charlie, helping Hank in recovery, and thinking of the other homeless veterans situation, he realizes that everything connects and he takes action to tackle the numerous problems ahead. 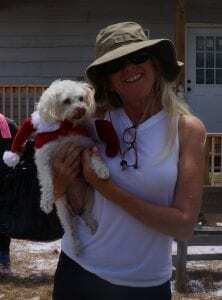 Producer and actress, Toni Hudson stops for a moment before a scene to pose with her dog Charlie who plays himself in Charlie’s Christmas Wish. 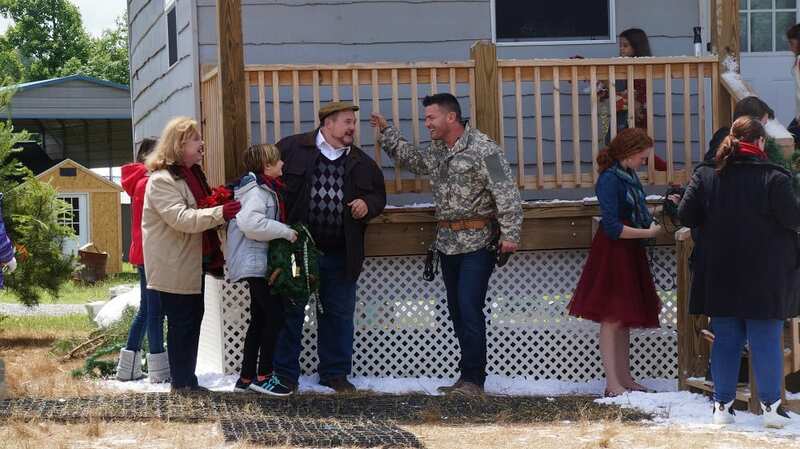 Filming in the Gilmer area only in the recent weeks, Charlie’s Christmas Wish was created last November 2017. Just like John, Hudson said the filming has had to overcome its own troubles fighting the rain and the heat in the area with the characters dressed for winter as well as a much smaller schedule as they are looking to release the movie to theaters this November 2018. The one-year schedule is highly unusual as most films look for at least two years in production before release. Now, the film has grown into a something more as topics like PTSD and homeless veterans have become major themes in the movie. Hudson admitted a certain balance had to maintained to bring these heavy themes into a family and kid-friendly film. The film hosts a number of aspects to “lighten” the feel such as two bumbling dog catchers attempt to chase Charlie and the construction company owner who doesn’t know how to build anything. Other soft moments come through as Hudson mentions Charlie is the smartest person in the movie and talks with God at points. Walker Mintz, left, plays Jimmy Frost, the son of John Frost, right, and Charlie’s best friend in the Frost family. The idea of Charlie and the Frost family showcases a family look at some very real issues today, a theme that is easier to explore with the independent status of the movie. But digging deeper, Hudson says what makes this movie special is the “heart” behind it, whether it’s healing John’s heart as he comes home, Charlie becoming the heart of the family to grow closer together, or one town showing what we can do to be the heart of change in major issues like homeless veterans. Hudson took that one step further in one last comment. While she doesn’t have a solid plan yet, she is pushing for another step in film-making. As the focus on homeless veterans becomes more apparent in the later part of the story, it has become more apparent to her. She suggested that she wants Charlie’s Christmas Wish to be more than just a movie. Moving past just mentioning it in the film she began toying with ideas like adding a donation to ticket prices and sales. She said she wants people to “be open” to the subject and to support the movie, support the issue at hand, and support those who defend our freedoms. ELLIJAY, Ga. – Ellijay has been seeing stars lately as Robyn Lively (The Karate Kid Part III, Teen Witch) and Shanola Hampton (Showtime’s Shameless, You Again) will star in Through the Glass Darkly, a psychological thriller co-written and directed by Lauren Fash and co-written by Susan Graham. Director Lauren Fash, center, smiles after another take of a scene in Through the Glass Darkly. Lively and Hampton play Charlie and Amy, an unlikely duo that team up to solve the recent kidnapping of a local girl, a crime which echoes the disappearance of Charlie’s own daughter. The script was featured in the Sundance/Women in Film financing intensive in 2017. FetchYourNews (FYN) was allowed on set for a chance to speak with those involved in the film as they spent the day downtown in Ellijay at the Gilmer County Courthouse. With other locations including Pickens’ Tate House, the filming is set to continue into early March. Fash told FYN that the majority of the film was being handled in Georgia with some aid provided by some post-production in Los Angeles, California. Officer Braden (Vince Foster) speaks with reporters after escorting Charlie out of the Sheriff’s Office. Fash said the film still has a lot of filming and post-production ahead of them meaning they will probably see their release in 2019. Graham, of However Productions, is producing along with Autumn Bailey-Ford, of Autumn Bailey Entertainment, and Carmella Casinelli, of Bon Aire Productions. The film is executive produced by Stacey Davis and Jim Rine. Set in 1997, Through the Glass Darkly follows Charlie, a 43-year-old woman recently diagnosed with Alzheimer’s disease, living in small town Georgia with her wife. When Elodie Carmichael, granddaughter of the town’s matriarch, goes missing, paranoia shakes the core of this sleepy community, reviving old ghosts and long-buried secrets. The movie itself has become an emotional work for Fash who says she has dedicated the film to her grandmother who has been diagnosed with Alzheimer’s. “Through the Glass Darkly, a film I’m dedicating to my grandmother, will delve into the mindset of someone suffering from Alzheimer’s. 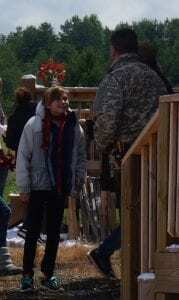 The ﬁlm will be shot entirely from Charlie’s point of view. I want people to experience the dark tension of a mind torn between reality and delusion. And yet, how a person’s innate character can hold fast despite this insidious illness,” said Fash. Shanola Hampton plays Amy, a reporter following the disappearance of Elodie Carmichael. It’s rather easy to see how much Fash has given to the film, not just in work and sweat, but being a writer and director on the film allows another level of intertwining the mind behind the story into each character, each scene, and each frame. “I’ve been living with this story and these characters for three years, so everything is alive to me … I know this story through and through, I know every in and out. The creative process was a really long one, but it allowed me to really understand my characters and really understand the twists and turns of the story,” Fash stated. Fash went on to say that those who know her will see a lot of her in the film as she continues to pour herself into the direction as well as the writing. “As a writer, in general, you’re always going to pull from your life experience,” Fash said. Even the locations show through the life of Fash as she spent her childhood visiting Jasper and Ellijay as her family had property in Bent Tree in Pickens County. The locations jumped to the forefront in Fash’s mind when she was writing the script through very fond memories of our towns. As Fash tells it, “One of the themes of this movie is timelessness and things kind of staying the same over the years. These small towns, they all have that feel of having that timeless factor to them.” Instantly thinking of her childhood adventures to the area, Fash never thought past Jasper and Ellijay to provide a better set for her fictional town in the movie. Being an independent film has allowed for the depth of connection between the film and its writer/director who says the film has other restrictions in budget and similar areas, but the freedom comes through the control over her vision she has without alteration. “At the end of the day, creatively, we have full control because we don’t have anyone to answer to. We were able to finance this film through investors and people who believe in the story and believe in the script,” Fash said. Vince Foster, left, and Robyn Lively play Officer Braden and Charlie as they film the new movie Through the Glass Darkly in Ellijay, Georgia. Shanola Hampton, left, and Robyn Lively pose for a picture in between takes of Through The Glass Darkly in Ellijay, Georgia. Fash called Hampton “a light” on projects she is involved in. While admitting she didn’t have personal knowledge before casting her, Fash says her film is a very dark film, but Amy, Hampton’s character, is the light in that darkness. Seeing the chemistry of those involved, to see the action on the set and the crew hard at work, it is a rare treat to be allowed access to this work in progress and to have moments with each involved. Truly seeing the massive team that works so hard on these projects adds a weight to the film. 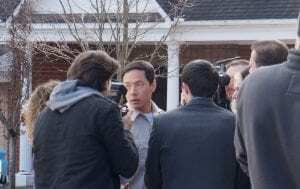 As filming continues through the next several weeks, the project will move across our two counties and is set to spend an entire week filming on location in the character’s home. Follow along the journey of Through the Glass Darkly through their social links on Facebook, Twitter, and Instagram before it hits theaters next year.